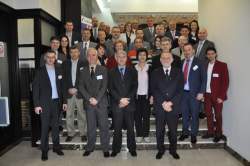 Twenty-two (22) experts participated in seminar, out of which thirteen (13) of them from the participating DPPI SEE Parties (Albania, Bulgaria, Bosnia and Herzegovina, Croatia, Macedonia and Montenegro), eight (8) Serbian representatives and one (1) expert from the Danish Emergency Management Agency (DEMA). Traditionally, Mr. Predrag Maric (Serbian Head of Sector) gave opening remarks on day 1. The Head of the Secretariat attended the seminar in the afternoon of day 1 and for the whole duration of day 2. The seminar was organized as a plenary session on the day 1 and as a workshop on day 2. 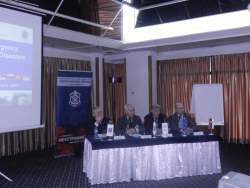 Target audience included managers and experts of the national and local protection and rescue services involved in the development of emergency response plans. The plenary session was dedicated to country presentations followed by related discussions where different aspects of the disaster response planning were addressed and then used as the platform for problem-analysis and drawing of relevant conclusions & recommendations. The workshop discussion on day 2 focused on brainstorming on the sub-topics that as part of the seminar agenda were communicated to the participants in advance (plan-development methodology, solutions for strengthening the capacities through involvement of different stakeholders in the planning process, funds needed for implementing the plans, control and assessment of implementation, etc.). The seminar was evaluated by the participating DPPI SEE Parties’ as being highly informative and of relevance to the agendas of future similar events in the DPPI SEE annual programmes.